A little over a year ago we purchase this sweet little homemade trailer that we found on Craigslist in Arizona. 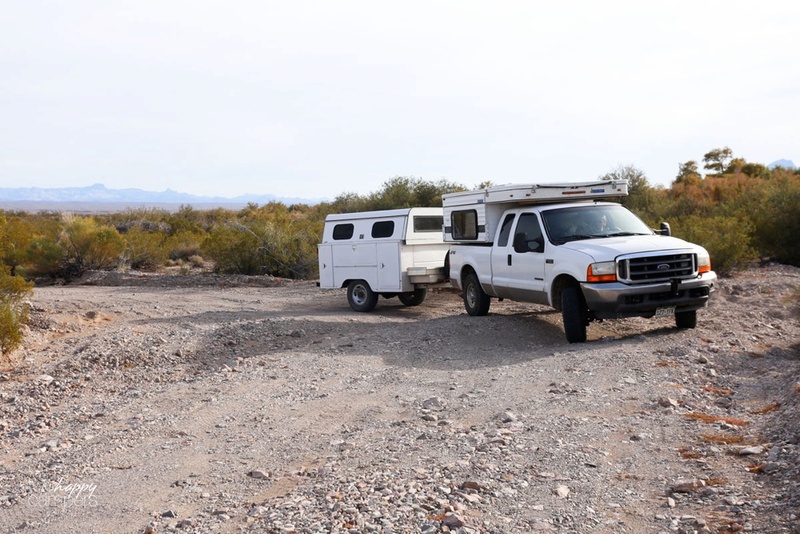 While our Four Wheel Camper had proved to be the perfect setup for us, we were in need of just a little extra space for our extended winter trips that typically last anywhere from 4-8 weeks. We knew we needed something unique because we wanted it to be able to follow us anywhere. 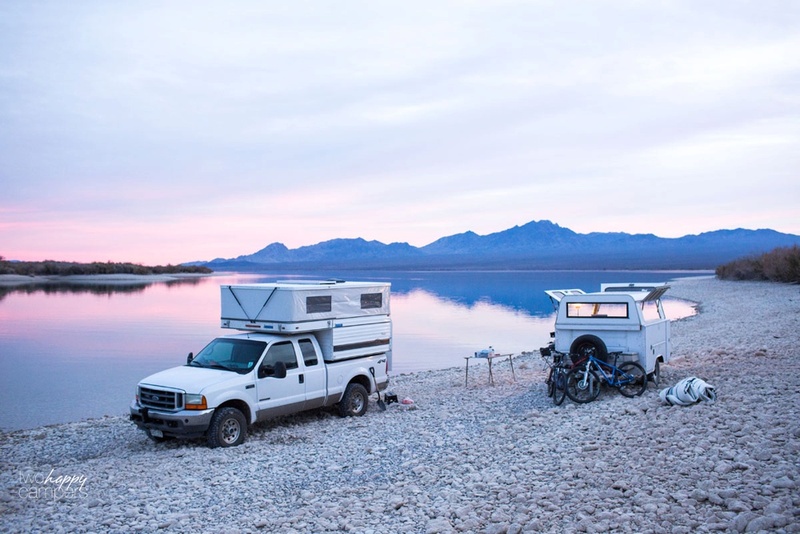 We looked in to specialty adventure trailers but we just couldn’t swallow the price tag. It seems like with enough time spent looking, you can find just about anything on Craigslist. What we eventually found was this utility bed trailer, complete with truck topper (making it completely enclosed) and toolbox. What drew us to it was it’s high-clearance and the fact that it is exactly the same width as our truck and uses the same size tires. We know when we are picking a line through a rocky or rutted stretch of road, the trailer will follow directly behind us. 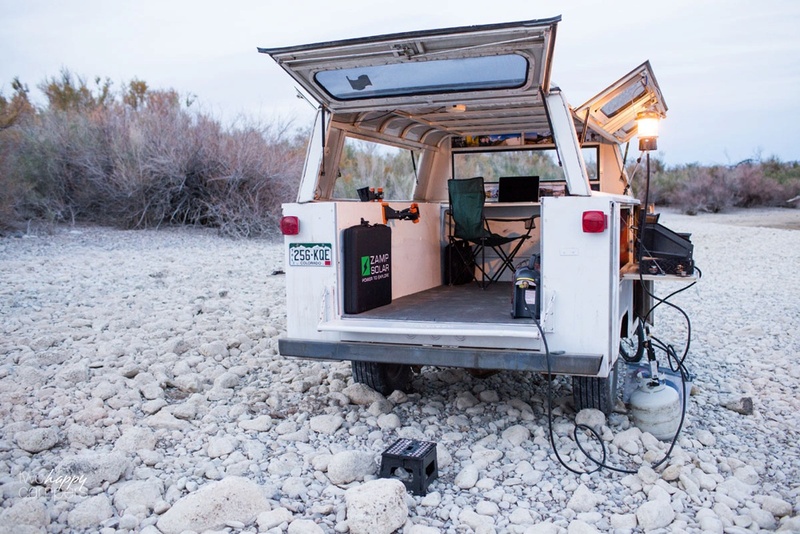 While this little guy has loads of potential to be built out as a totally outfitted camping rig (we’ve talked about adding solar, a refrigerator, awning, outside shower, etc.) for now we’ve only done some very minor modifications and fix-ups. The ability to carry extra resources and supplies (and toys!) such as water, propane, firewood, bbq grill, bikes, paddleboards, the list goes on, proved to be pretty sweet this past winter. 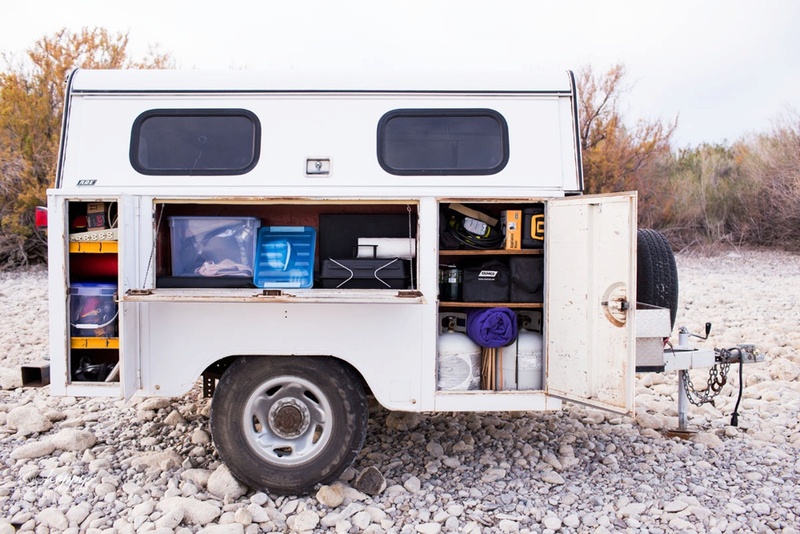 We did manage to fit a lot of this stuff in the truck before the trailer but strategically unpacking and packing everything, not to mention stowing everything beneath the truck so that we could use the inside of the camper was becoming quite cumbersome. Mark loves that the trailer allows us to carry everything we could ever need while camping and I love using it as a mobile office. 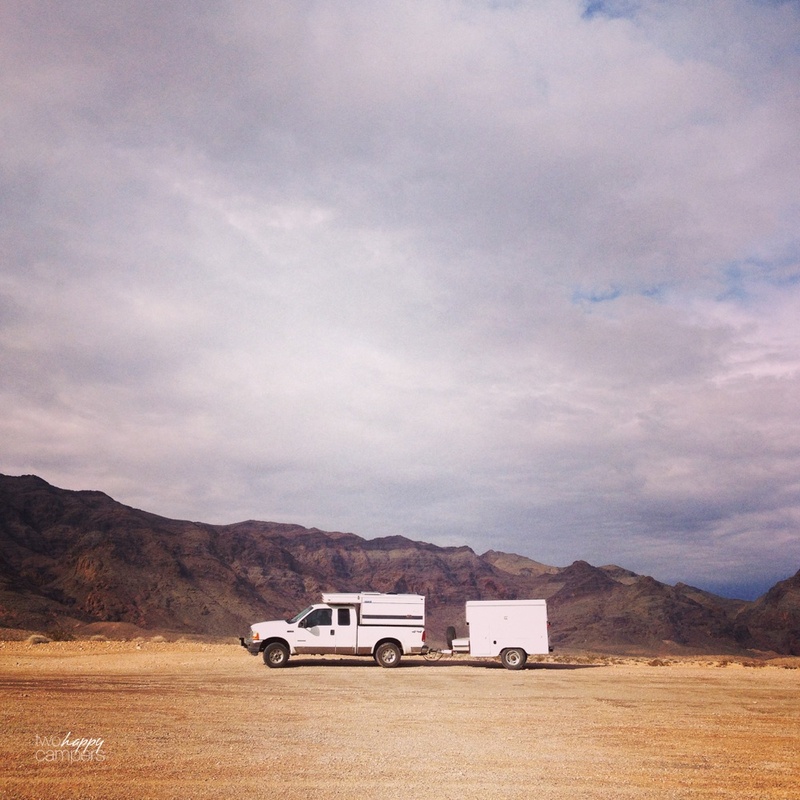 Below: On our way to one of our favorite camp sites on the shores of Lake Mohave. Below: When we bought the trailer there were two stainless steel folding doors that were used to access the back of the trailer. We found them a bit cumbersome so Mark built a simple wood panel that slides in and out and also acts as our camp table. Below: As you can see, we’ve had no problem filling all the extra space the trailer offers. 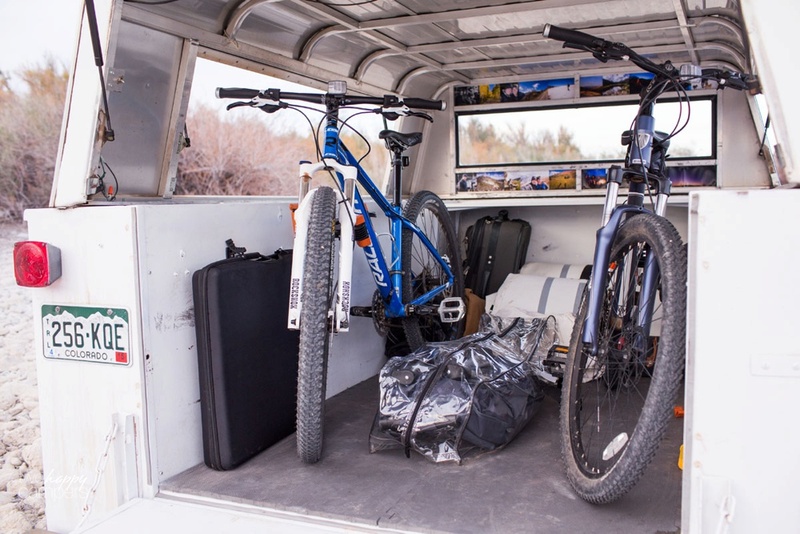 We felt it was important to pack the cabinets pretty tight so that all our belongings weren’t sliding all over the place as we bumped down dirt roads. 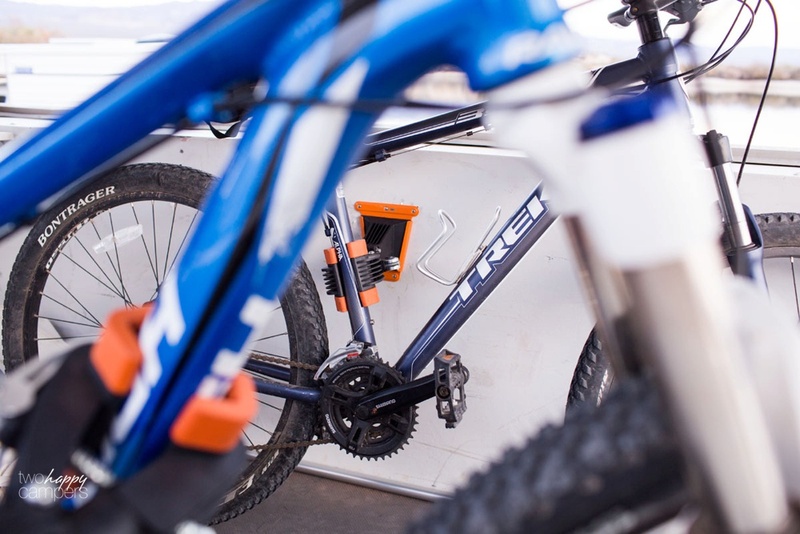 Below: Our bikes are held securely in place with these removable bike clamps. 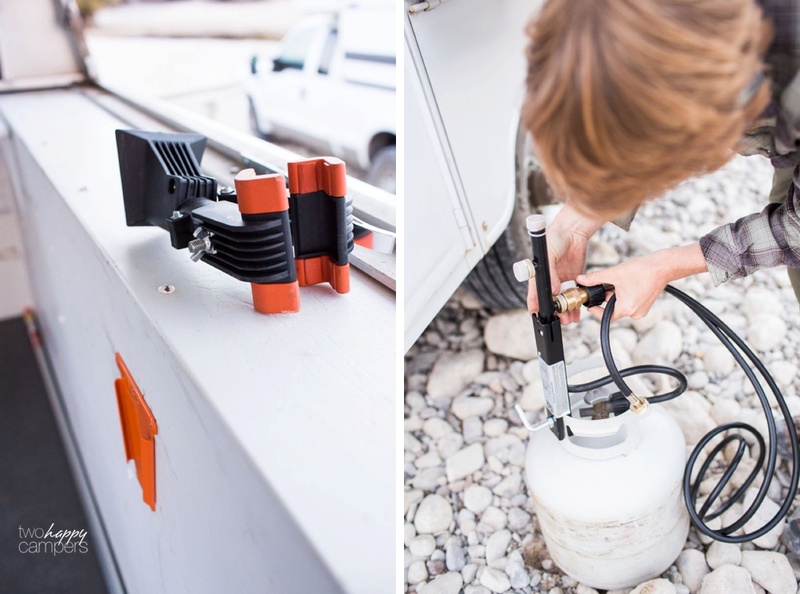 When we’re using the interior of the trailer to sit and eat or work, the clamps slide right out of that orange panel you see against the wall so they’re never in the way. Below right: With the ability to carry around 2 – 20lb. propane tanks, we’re never short on propane. The propane tree below allows us to hook up multiple items at a time such as our lantern and stove. 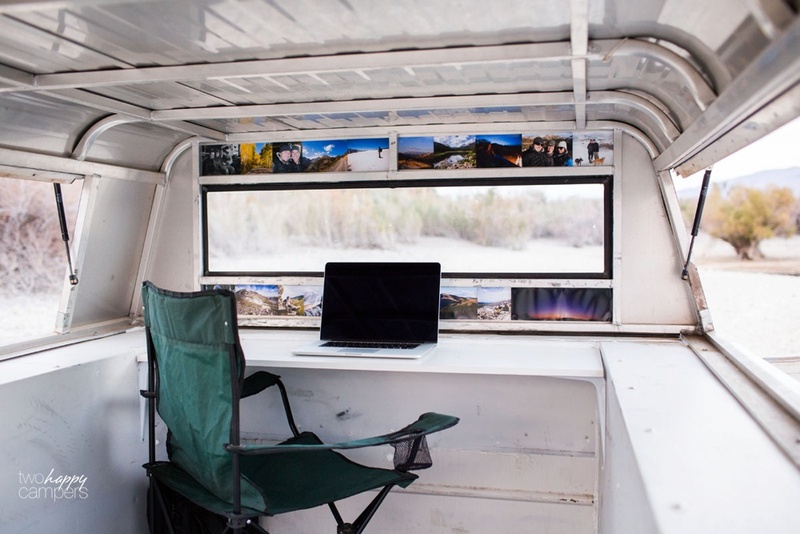 Below: If you had told me when we bought the trailer that I would love using it as an office, I would have looked at you cross-eyed but it turns out the be the perfect working space. It’s an awesome indoor/outdoor space that is completely protected from the wind and rain while letting in loads of sunshine. Below: While I work inside, Mark cooks outside. 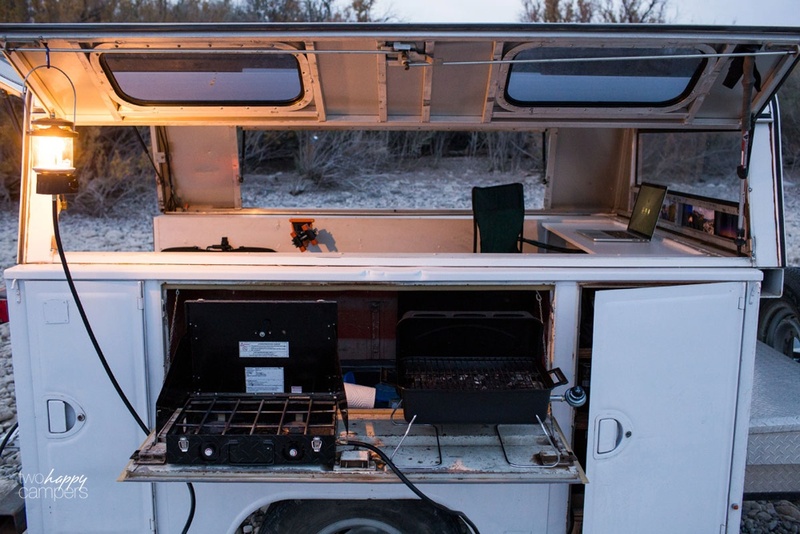 The cabinet below is the perfect camp kitchen. It stow our stove, grill, cast iron and all our cooking utensils. 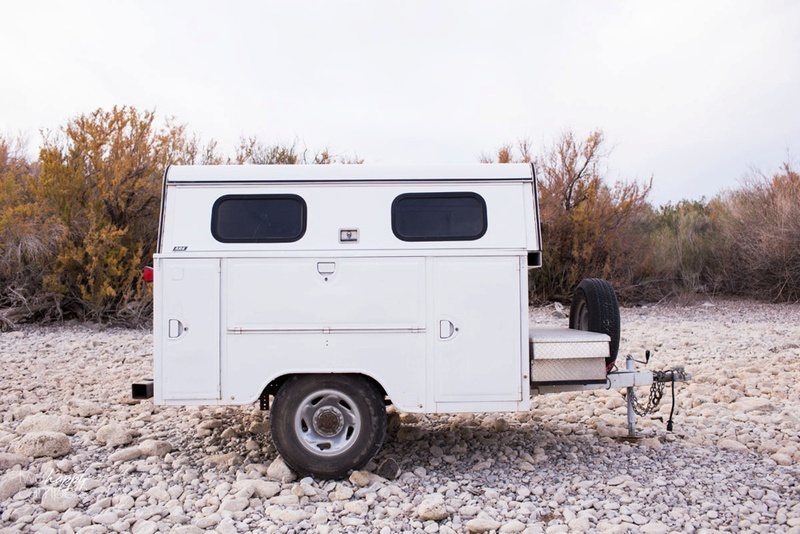 Below: It’s the perfect addition to our Four Wheel Camper! That is a great trailer setup!! 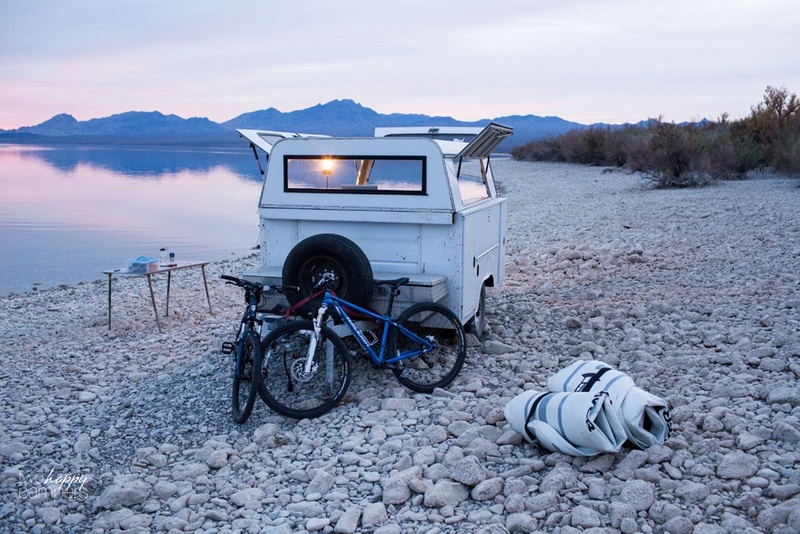 I plan to purchase a popup truck camper similar to yours soon and a trailer like your would be a great addition to the setup. On your last post you briefly covered the utility trailer. I was thinking that. I should email you to do a write up on it…and here we are with your next post. I love the trailer and how it functions for your needs. I’m in the beginning process of building my cargo trailer conversion. Thanks for the write and keep sharing. Thanks for reading David! Glad you enjoyed the trailer post! Where can I buy one of these as I can’t make it on my own :(. Thank you for this write up. We have a FWC hawk just like yours but have been pretty graduated with three lack of storage space inside it. Your trailer is a wonderful solution. Can you give us any more information on similar utility trailer. I doubt that yours will be for sale anytime soon! Thanks so much for reading! Since our trailer is homemade, I can’t point you anywhere to find something similar. However, I’d start by searching Craigslist for “utility bed trailer”. Nice post! I have been looking forward to this one 🙂 I really like the bike holders! 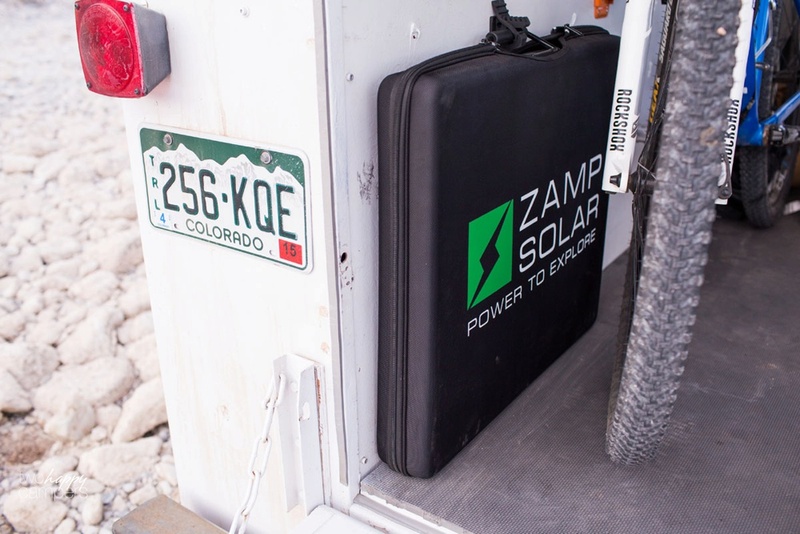 Do you store your water in the trailer or in the camper? Maybe a small sink on the trailer in the future? Thanks again!!! Thanks Greg! When we have the trailer, we store most of our water in the trailer just because we have the room. We do always keep a 7 gallon jug beneath the dinette seat in the camper just in case. A small sink on the trailer would be awesome and we’ve definitely talked about it. We’ll see! 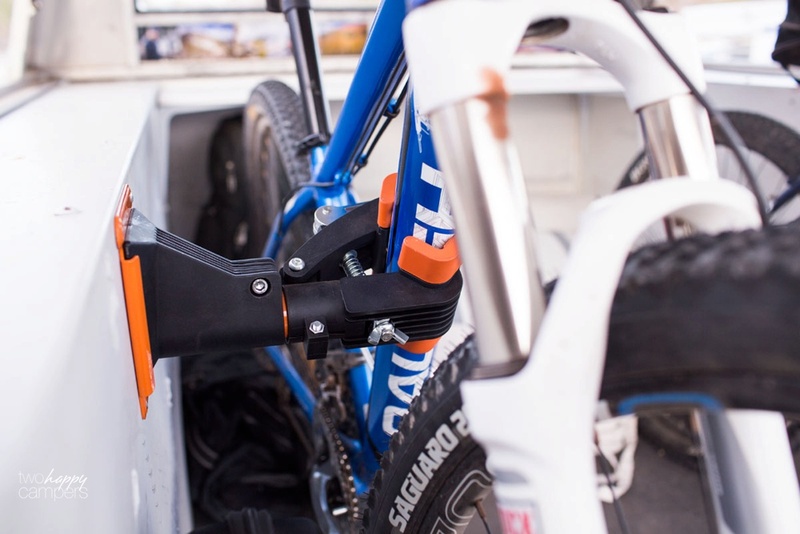 The bike Clamps are an awesome idea!! We love our trailer. That’s awesome that you found something similar. We cut a piece of plywood to fit the gap between the topper and the tailgate. To make that a dual-purpose piece, we added folding legs to the back of the plywood so that it could function as a table at camp. I hope that helps! Way too cool!!! Love it!!! What would this type of trailer cost from a manufacturer? 30 grand? Probably. Great setup. This type of trailer would suit my needs so thanks for the idea. Thanks! We love it. 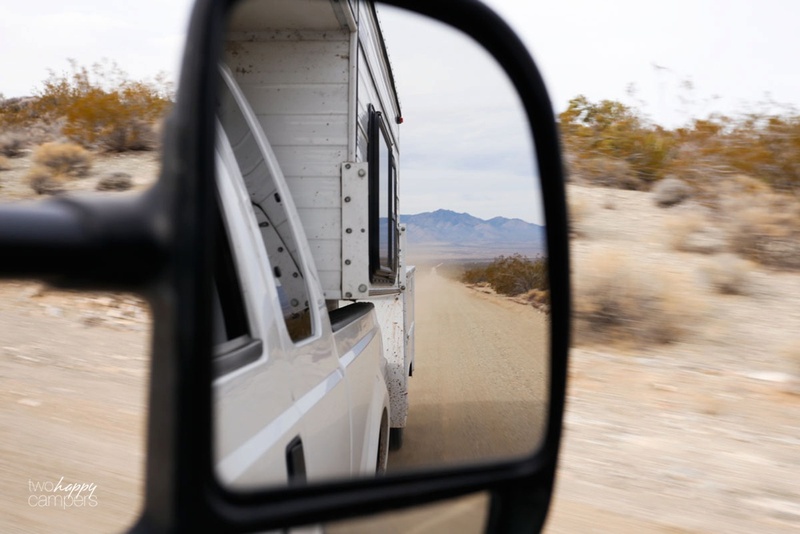 We got a fiberglass Casita travel trailer to live out of for the last year but now that we’re back to living in a house we can’t wait to get back to using our utility trailer. It’s perfect for extended camping trips!